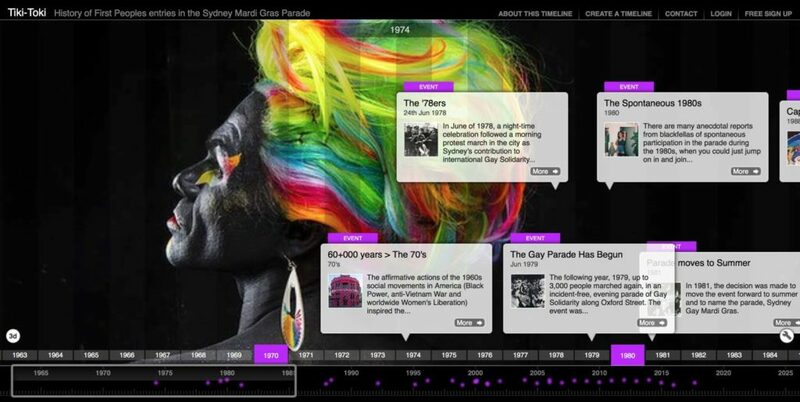 It’d been on my mind about helping to get the history scored of First Peoples’ entries in the Sydney Mardi Gras Parade, before we older people forget those parts of the history we have experienced – or are gone ourselves along with our memories and the yarns shared with us by those already gone before. Head curator: Tim Bishop. Co-curators: Liza-Mare Syron and Mish Sparks. The online timeline is a community-owned site of a community-owned shared history. The project is forever ongoing, for as long as the memories keep rolling in and the Mardi Gras Parade keeps rolling along. This recorded history relies on the input of stories, history, photographs and support from community. Your stories can be recorded on the facebook group page for this site, Aboriginal and Torres Strait Islander Mardi Gras.